How much should you tip on a cruise ship? This is a never-ending debate but we hope this guide can help you out where we cover and simplify each cruise line tipping policy. Keeping checking back on this page for the latest cruise gratuities on major cruise lines. 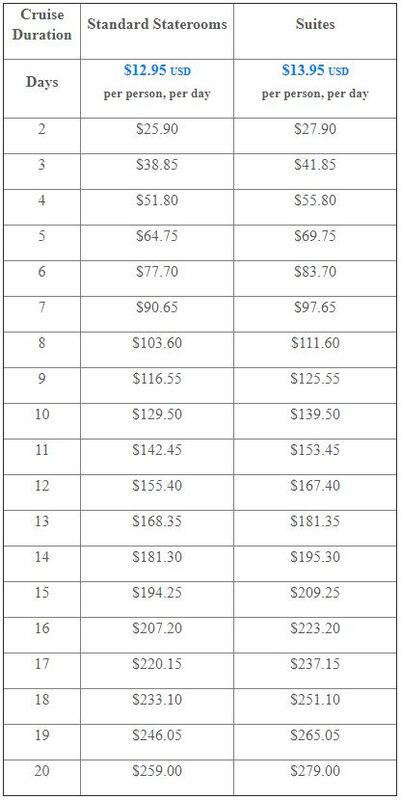 Before we get into each cruise line tipping policy details you’ll need to know the basics of this service charge and why it is so important. Gratuities or otherwise known as cruise ship tipping is an important aspect of crew salaries and the amount guests pay will be divided between certain crew members like the stateroom steward and dining room waiter. The cruise line will charge an automatic rate from the onboard account at the end of the cruise. This amount is chosen by the cruise line and is usually the normal amount to pay. However, guests can choose to alter the auto gratuity rate at the end of the cruise by increasing or lowering. As this money does go to the hard-working crew members it is suggested to never lower the amount or even remove them entirely. Guests can also increase the tipping amount if a certain crew member goes above and beyond. Please Note: Cruise Line Gratuities are constantly changing and we’ll update any rate changes on this page but it may not immediately happen. Even though guests can choose the final gratuity amount at the end of the Carnival cruise there is an auto-suggest amount. At the moment it is $12.95 per day for guests in a standard stateroom and $13.95 per day for guests booked in suites. So the amount per day is broken down with $4.05 ($5.05 for suites) going to the housekeeping team, $6.40 to the dining team and $2.50 to other alternative onboard services. For beverage purchases the cruise line does charge 15% gratuity on the Sail & Sign account, this can be seen on the receipt when making purchases. A gratuity charge will also be done for Chefs table and room service during the cruise. Guests can also prepay their cruise gratuities before the actual cruise during the booking process. Check Carnival’s official page for gratuities. Celebrity Cruises has gratuity program which is set for three different cabin categories. The price per day for guests in standard staterooms is $14.50, for Concierge Class and AquaClass staterooms the rate is $15.00 per day and for suites, the rate is $18.00 per day. When buying beverages from the bar or anywhere else onboard the Celebrity cruise ship guests will be charged 18% as seen on the receipt. Purchases and the auto cruise gratuities are charged to the onboard SeaPass account. The total amount is shared between the stateroom steward, dining room staff and those who help from the housekeeping department. if any crew member goes above and beyond with service the rate can be increased at the end of the cruise. Check the official Celebrity Cruises gratuities page here. We now come to Norwegian Cruise Line’s gratuity program which being called Service Charge on NCL ships. With this cruise line gratuities are a little more complicated because there are ships with different rates and as of writing this Norwegian Line announced a hike in the rates from April 1, 2018. For standard staterooms and up to Mini-suites the rate per day is $14.50, for guests in the Haven and suites the rate for each guest per day is $17.50. For cruise ships based out of Port Canaveral, Florida there is an increased rate applying to Norwegian Sky and Norwegian Sun. The rate is $22.99 for guests in suites and $19.99 for those booked in mini suites and below. Just remember all rates are charged per person per day. Check the official NCL site for gratuities. Royal Caribbean gratuities apply to all guests of all ages on all cruise ships. The rate per guest per day for regular cabins is $14.50 and for those booked in suites, the rate is $17.50. The auto tipping which is charged to the SeaPass account can be altered if a guest chooses to due to unsatisfactory service. The money is divided among key crew members including the stateroom steward, other housekeeping staff, and dining staff. Do check the Royal Caribbean site for official details by clicking here. This is an essential part of a crew members salary so even though cruise lines d allow guest to alter the amount it would be best to not lower it. Do note that not all crew are included in this payment structure. Many staff members working in the shops, casino and more have their own salaries and not paid by the cruise line so guests wouldn’t have to worry about tipping them. However many do have bonuses and depending on the items or packages purchased. For further advice on cruise gratuities, we have a wide collection of articles which can be found here. 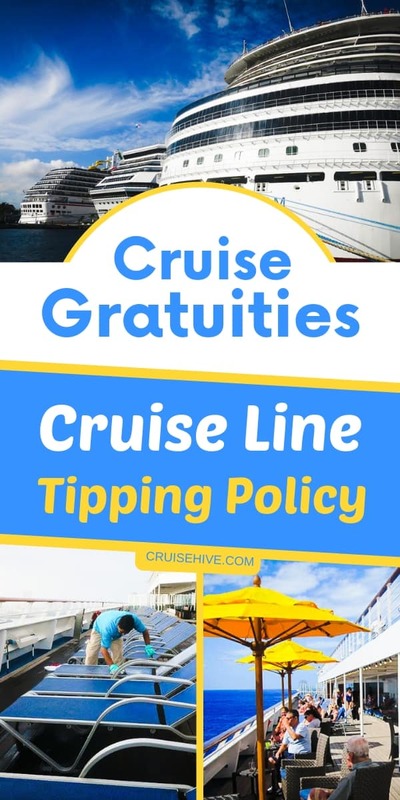 We’ll be adding more cruise lines over time and will keep making updates so do keep this cruise line tipping policy page nearby.